WARNER BROTHERSVampires, werewolves and a family of quirky characters collide as Dark Shadows comes back to life, arriving onto Blu-ray Combo Pack, DVD and Digital Download on October 2 from Warner Home Entertainment Group. Directed by Tim Burton and starring Johnny Depp as Barnabas Collins, Dark Shadows follows a vampire awoken from a multi-century sleep only to find that the family business is near ruin, his descendents are struggling and his past may come back to haunt him. Burton directed Dark Shadows from a screenplay by Seth Grahame-Smith, story by John August and Grahame-Smith, based on the television series created by Dan Curtis. The film was produced by Oscar winner Richard D. Zanuck (Alice in Wonderland, Driving Miss Daisy), Oscar winner Graham King, (Rango, The Departed), Johnny Depp, Christi Dembrowski, and David Kennedy. Johnny Depp leads the acclaimed cast, which also includes Michelle Pfeiffer, Helena Bonham Carter, Eva Green, Bella Heathcote, Chloë Grace Moretz, Johnny Lee Miller, Gully McGrath and Jackie Earle Haley. 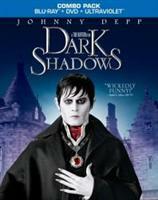 Dark Shadows will be available on Blu-ray Combo Pack for $35.99 and on single disc DVD for $28.98. The Blu-ray Combo Pack features a hi-definition and standard definition copy of the film and UltraViolet; and the single disc DVD features a standard definition copy of the film and UltraViolet. Becoming BarnabasIt takes more than just a set of prosthetic fangs! Get the scoop from directly from Johnny Depp on his reimagining of this infamous and undead cult character. Welcome to Collinsport!Explore every strange nook and peculiar cranny of the most spectacularly detailed city to never exist! A Melee of Monstrous ProportionsJoin the fight and experience the thrilling final battle sequence in a way that only Tim Burton and Johnny Depp could imagine. Angelique: A Witch ScornedJohnny Depp and Eva Green reveal the lurid details of their character's centuries old lascivious and tumultuous relationship. Reliving a DecadeFrom groovy bell bottoms to classic rock & roll, strut through the Collinsport of the 70s and discover the topsy-turvy world that Barnabas finds himself in after centuries in the grave. Dark Shadowy SecretsWatch out for exploding buildings and all manner of bizarre, supernatural occurrences as Tim Burton's spectacular props and special effects wizards bring this eccentric world to crazy life. The Collinses: Every Family Has its DemonsBecome scarily familiar with this creepy cast of quirky characters as Johnny Depp, Helena Bonham Carter and their co-stars reveal their unique working relationship. Cooper Rocks Collinsport!Shock rock the night away with the master of musical horror himself, Alice Cooper, as Johnny Depp and the cast invite him to rock the roof off of Collinsport Manor. Dark Shadows: The Legend Bites BackUncover the method behind Tim Burton's madness as he twists and tweaks his favorite classic movie monsters for the gothic universe of Dark Shadows. The Johnny Depp Zone's original content is copyright 2001-2016 by Theresa, Natalie and Rosemary. Original HTML and graphic design is copyright 2004 by Maria, updated by Andre. This fansite has no official affiliation with Johnny Depp, his family or management. No copyright infringement is intended: images and articles are used without permission and are copyright of their respective owners.